The pace, type and style of work has changed. It’s becoming rarer and rarer to still work in the same building or even the same country as your boss. Even if you do work in the same building, chances are, most of your interactions feel virtual since email, chat, wiki’s, communities and bug tracking are so engrained in our work lives. 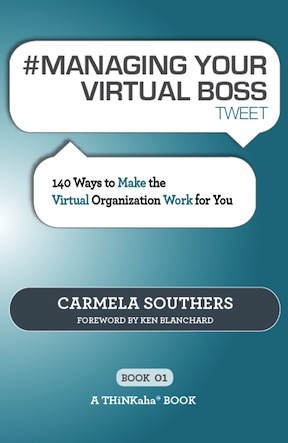 That’s why #MANAGING YOUR VIRTUAL BOSS tweet — 140 Ways to Make the Virtual Organization Work For You by Carmela Southers is a must read for any one that uses these new technologies. Now, more than ever, all of us need to be able to use all of the latest and greatest technologies to be an effective member of a team. This technology push has allowed knowledge workers to pretty much work anywhere in the world. This means that the traditional boss/employee relationship has significantly changed. In order to thrive in this new relationship, we need to understand the dynamics of having a virtual boss, a long distance boss or a busy boss down the hall. Technology was supposed to make our work life easier but in reality it’s changed how we need to interact with our boss. One major misnomer about a virtual boss is that they will be absent. They may be physically absent but they are always going to be present in your one-on-one interactions (via email or IM or phone) and in your work product. This presence is something that you need to understand and appreciate since your work product is a direct reflection of how good your boss gives guidance and instruction. It’s also how your organization and your boss with ultimately judge you. We all know how hard it is to communicate face to face let along over email, IM or over the phone. That’s why #MANAGING YOUR VIRTUAL BOSS is such an important resource for your relationship with your boss. It gives you a framework in which to be successful. The book is full of great tips that are easily digestible and actionable — something that is sorely needed in our 24/7 fully connected world. Aha #13 — Approach managing your boss as a challenge to your creativity not your ego. Aha #114 — Remember that if your boss does not succeed, you will not succeed. Aha #135 — Feeling isolated is normal. Staying isolated is a choice. At some point in our careers, we will have a virtual boss or a boss that’s as good as virtual. It’s an inevitable part of working in the 21st century. By learning to effectively and productively manage your boss, you will be a more valuable asset to your company and/or clients. Start down the road to virtual (and present) boss success by picking up a copy of #MANAGING YOUR VIRTUAL BOSS tweet today! Bit size, easily digestible nuggets of information. That’s how I define books from THiNKaha! It’s refreshing to see an imprint explore a new and creative way of helping us achieve more Aha! moments. They truly get that the pace of our lives warrants an approach that’s more of a coach yelling at us from the sidelines than the professor lecturing us on the finer points of whatever. Can you tell I drank the Kool-Aid :)? I really like the THiNkaha! concept. So much so that I’m writing a book for them that will be out soon. Yeah, I not only drank the Kool-Aid — now I’m making it!